Lake Country has made three distinct types of wool pads to maximize the effectiveness of our Wolfgang MetallWerk™ metal polishes. Two pads here are made with twisted wool, which is a compounding material. Among twisted wool pads, pads with shorter threads are more aggressive than those with longer twisted threads. Therefore our 4 Ply 100% Twisted Wool Compounding Pad has shorter threads than the 50/50 Acrylic Polishing Pad. The Final Polishing Pad is made of soft, fluffy, electrified wool. This wool is not twisted at all and is therefore gentler on the paint. The Final Polishing Pad is a gloss-enhancing pad. The Electrified Sheepskin Final Polishing Pad is made by electrifying the wool to remove microscopic barbs naturally found in wool. The resulting wool is soft enough for final polishing with a shine enhancing polish. This wool pad has 1 inch threads. 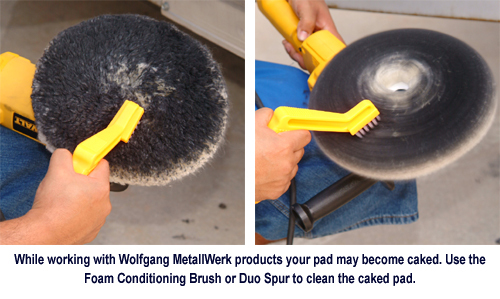 Use this pad with Wolfgang MetallWerk™ Aluminum Concours Polish. Available in 6.5 inches. 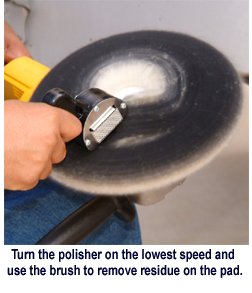 Wool Metal Polishing Pads are available in 6.5, 7.5, and 8.5 inches. 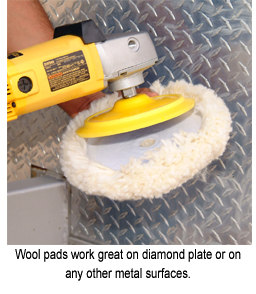 The 8.5 inch pads are for use with a circular polisher equipped with a 7 inch rotary backing plate. 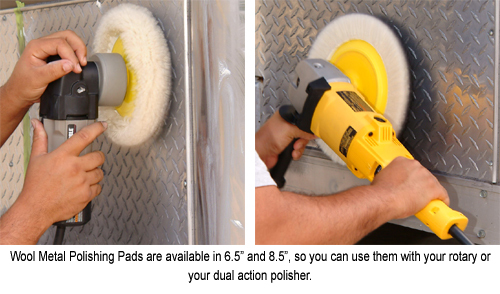 The 7.5 inch pads can be used on your Porter Cable 7424 or other dual action polisher, with a 6 inch DA backing plate, or on a rotary with a 6 inch rotary backing plate. The 6.5 inch pad uses a 5 inch DA or rotary backing plate. All pads have Velcro® brand hook and loop fasteners. With the polish turned off, lay it on a sturdy surface (like the ground) pad side up. Turn the polisher on and hold the polisher still with one hand while you hold the Duo Spur against the wool with the other hand. You don’t have to apply much pressure. Be sure to keep your hand clear of the spinning pad. After just a few seconds, the wool is fluffed and ready to go. Polishing aluminum or any other metal is a messy process. Depending on how oxidized the surface is, you may need at least 1 or 2 additional wool pads on hand. Fluffing the pad periodically will help but, when the pad becomes absolutely black from the oxidation residue, it is best to switch to a fresh pad. Immediately put the used wool pad in a bucket of McKee's 37 Polishing Pad Rejuvenator and water to soak. It’s virtually impossible to remove these residues after they’ve dried within the wool.